Philip II (1165-1223) - Philip II Augustus (in honor of the month of his birth) was the son born to King Louis VII that Eleanor of Aquitaine was unable to give him. After Louis' marriage to Eleanor was annulled (See Eleanor of Aquitaine) he married Constance of Castille, who died in childbirth. Phillip was the child of his third wife, Adèle of Champagne. Because he was the only son of Louis, born in his waning years, he was nicknamed Dieudonné which means "God-given". Philip's reign is closely associated with England as he was constantly meddling in the island's affairs. The two monarchies were closely tied together at this time. Remember that Eleanor of Aquitaine was married to both the Kings of France and England. In addition, Henry II's son, Henry the Younger, was married to Philip's sister, Margaret. So when Richard the Lionheart revolted against his father in 1189, Philip joined forces with Richard in opposing Henry. His assistance probably tipped the scales in Richard's favor. Henry died in 1189, and Richard became King of England. That same year, Saladin captured Jerusalem and the Third Crusade began. The war between France and England was quickly ended, and Philip and Richard both went to the Holy Land to fight in the Crusade. However, their roles were very different. Whereas Richard stayed all the way up until the failed attempt to retake Jerusalem, Philip returned to France after the fall of Acre, the initial battle. He had become sick with dysentery and felt his religious commitment had been met. Some sources also indicate that the Third Crusade was the beginning of a falling out between Philip and Richard as the Crusader army looked to Richard as their leader. This may offer some explanation as to why Philip shifted his support from Richard to his younger brother John (See Richard the Lionheart above). Philip is remembered as one of France's most powerful monarchs. His reign lasted 43 years, from 1180 until 1223. 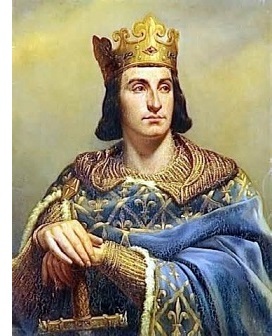 He is also the first ruler to be called the "King of France". His predecessors were called "King of the Franks". There is a great historical irony associated with Philip's reign. Under his rule, the French monarchy moved in the direction of acquiring greater power over the French people. Meanwhile, in England, the Magna Carta was signed in 1215 (while Philip was still in power), which for the first time placed limits on the English monarchy. Many historians argue that the roots of the French Revolution can be traced back to Philip's reign as he strengthened the king's power. Likewise, the roots of the American Revolution can be traced back to the Magna Carta, as power began to be decentralized away from the English king. Therefore the initial sparks of the two revolutions occurred at roughly the same time, and they also erupted at roughly the same time.